A 3-year-old Portland girl recovered yesterday after she swallowed and had 37 Buckyballs magnets removed from her intestines. Payton Bushnell was complaining of flu-like symptoms on Feb. 21, so her mother took her to the doctor. X-rays showed -and to everyone’s disbelief- that the toddler had a cluster of metal balls lodged in her stomach. She is said to have finally recovered yesterday after being in the hospital she she was initially admitted in February. The website even reported of two children swallowing one or two magnets but did not incur injury. Looks like that will have to be revised now that Payton Bushnell got her hands on the toys. In the past, one child has died and 19 others have been injured from similar toys with magnets in them. This led to the recall of 4 million toys by the Consumer Product Safety Commission. 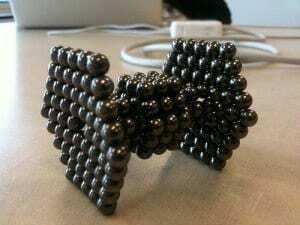 Buckyballs are, “intended to build unlimited shapes and patterns,” and avoided the recall.